Georgia workers may be at a high risk of toxic exposure to chemicals, fumes and hazardous materials in the workplace. A Macon-based company now faces fines by the Occupational Safety and Health Administration, which said it failed to ensure that workers were safe from these risks. According to OSHA, Macon-based Aerospace Defense Coatings of Georgia exposed its workers to dangerously high levels of toxic chemicals. The level of exposure was about eight times as high as the allowed limit. Further, OSHA found that this wasn’t the first time the company has engaged in such violations of worker safety rules. According to the federal agency, at least two of the three violations that it found at the company’s facility were repeat violations. It is seeking more than $83,000 in fines. According to the citations by OSHA, work areas at the facility were unsafe, and even dining tables were covered in the residue of chemicals like hexavalent chromium. The company provided workers with protective gear but failed to take other precautions to reduce toxic exposure. For example, it failed to provide a place for employees to change into protective gear safely. This increases the risk the contamination may spread to other areas in the facility, further endangering workers. In one case, the dangerous chemical was found on the steering wheel and the interior of a worker’s car. In another case, a worker at the facility was exposed to the dangerous chemical at levels of 41 mcg per cubic meter. The federal allowed limit is just 5 mcg per cubic meter. 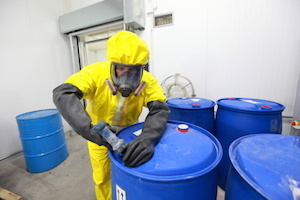 Prolonged exposure to toxic chemicals in this manner can cause a worker to suffer long-term occupational illnesses, including cancer, leukemia, severe anemia, asbestosis and problems with the central nervous system.